This Persistence Market Research (PMR) report examines the global diabetic gastroparesis treatment market and identifies trends likely to govern the market during the period 2016–2024. The primary objective of the report is to offer updates and information related to market opportunities in the global diabetic gastroparesis treatment market. The report analyzes the global diabetic gastroparesis treatment market in terms of market value. This report also provides useful information on drugs and surgical treatment products used for patients suffering from diabetic gastroparesis disorder. To understand and assess opportunities in this market, the report is categorically split into four sections based on product type, disease indication, distribution channel, and region. 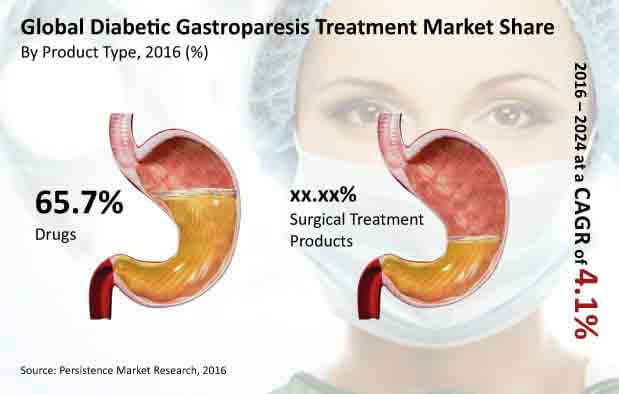 The report starts with an overview of the global diabetic gastroparesis treatment market along with product categories used to control the symptoms of diabetic gastroparesis disorder such as nausea, vomiting, and abdominal pain. This section also covers the revenue performance of the diabetic gastroparesis treatment market both globally as well as regionally. A detailed analysis of key trends, drivers, and restraints from the supply and demand perspectives are also included. The next few sections analyze the market based on product type, disease indication, distribution channel, and region and present a forecast in terms of value for the period 2016 to 2024. In the final section of the report, the global diabetic gastroparesis treatment market landscape is included to provide report audiences with a dashboard view based on categories of providers in the global diabetic gastroparesis treatment product portfolio. The report provides insights into key developments and strategies adopted by leading companies operating in this market. Some of the market leaders profiled in the report include Janssen Global Services, LLC, Salix Pharmaceuticals, Inc., Abbott Laboratories, Medtronic, C. R. Bard, Inc., Kimberly-Clark Corporation, Boston Scientific Corporation, Cardinal Health, Inc., Rhythm Pharmaceuticals, Inc., Evoke Pharma, and Alfa Wassermann SPA. To arrive at the market size, the report considers revenue from the sales of diabetic gastroparesis products in key markets across five geographies. The forecast presented here assesses the total revenue generated by diabetic gastroparesis drugs and surgical equipment manufacturing companies. The market forecast takes into consideration basic fundamental dynamics of the disease spread, regional epidemiology, and currently available treatment options. Given the characteristics of the market, the report presents triangulated data based on different supply side and demand side analysis as well as market dynamics. The report also considers regulations (particularly pertaining to labeling of drugs and medical device reporting for devices) and government guidelines. Quantification of data has been considered along with provision of quality insights collected directly from the market through discussions with product managers, marketing managers, and other industry experts. The report also presents Year-on-Year (YoY) growth based on regional market growth analysis in order to understand market predictability and to identify the right opportunities in the global diabetic gastroparesis treatment market. A detailed analysis of all market segments in terms of Basis Point (BPS) helps project individual segments’ relative contribution to market growth. This detailed level of information is important for identification of various key trends in the global diabetic gastroparesis treatment market. Another key feature of this report is the analysis of the global diabetic gastroparesis treatment market by region – which is further segmented on the basis of countries – and highlights revenue forecast in terms of absolute dollar opportunity. Regional trends have been introspected, identified, and applied while forecasting growth rates in the market. Absolute dollar opportunity provided in the report is critical and is expected to help in assessing the level of opportunity that a provider can look to achieve from a sales perspective. Persistence Market Research has also developed a market Attractiveness Index for all segments to help identify real market opportunities. Delayed gastric emptying associated with diabetes is known as Diabetic Gastroparesis (DGP). Though it occurs in patients suffering from both Type-1 and Type- 2 diabetes, it is more common in female patients suffering from Type-2 diabetes. The cause of DGP is inherent damage in the vagus nerve that controls the movement of food through the digestive tract. The global Diabetic Gastroparesis treatment market is likely to witness extensive growth in the next eight years due to an increasing incidence of Type-1 and Type-2 diabetes. The global diabetic gastroparesis treatment market is expected to register a CAGR of 4.1% over the forecast period (2016–2024) and reach a market valuation of US$ 3,769.3 Mn by 2024. While North America is expected to remain the most dominant market, the Asia Pacific market is anticipated to witness the highest CAGR of 4.5% during the forecast period. Factors such as rising prevalence of diabetic gastroparesis with high unmet medical needs and availability of reimbursement for in-patient hospital stays in developed countries are expected to drive growth of the global diabetic gastroparesis treatment market over the forecast period. Increasing use of diabetic gastroparesis drugs to control symptoms such as nausea and vomiting is anticipated to fuel growth of the global diabetic gastroparesis treatment market over the forecast period. Also, increasing affordability among people and easy access to medicines are further expected to boost market revenue growth over the forecast period. However, usage of non-prescription drugs to control the symptoms restricts diagnosis of stage 1 and stage 2 gastroparesis. Lack of clinical evidence on improvement offered by prescription drugs and termination of clinical trials are factors expected to hamper growth of the global diabetic gastroparesis treatment market over the forecast period. The market is likely to witness key trends over the forecasted eight year period. An increased focus on consumer friendly pricing of diabetic gastroparesis drugs and devices is expected to boost treatment uptake at a global level. Further, innovation in product offerings and creative marketing initiatives undertaken by market players is anticipated to increase penetration and market entry of new devices. The global diabetic gastroparesis treatment market has been segmented on the basis of product type (drugs, surgical treatment products), disease indication (compensated gastroparesis, gastric failure), and distribution channel (hospital pharmacies, private clinics, drug stores, retail pharmacies, e-commerce). The drugs product type segment is expected to account for the maximum revenue share of the global diabetic gastroparesis treatment market by 2024. Sales revenue of this segment is anticipated to expand at a CAGR of 3.6% over the forecast period. Sales revenue of surgical treatment products is expected to increase at a CAGR of 5.0% over the forecast period owing to long-term relief provided by intervention. The compensated gastroparesis disease indication type segment is estimated to account for 66.1% share in the global diabetic gastroparesis treatment market by 2016 and is likely to register a CAGR of 4.5% over the forecast period. The gastric failure disease indication type segment is expected to account for 33.9% share in the global diabetic gastroparesis treatment market by 2016. The hospital pharmacies distribution channel segment is expected to expand at a CAGR of 4.6% in terms of revenue over the forecast period. The e-commerce distribution channel segment is expected to account for 9.5% share in the global diabetic gastroparesis treatment market by the end of 2016. 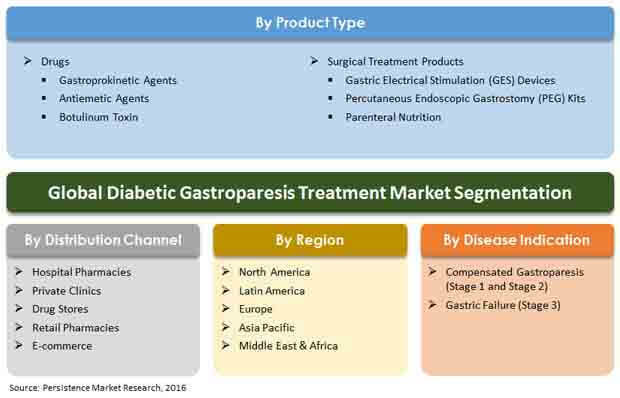 The global diabetic gastroparesis treatment market has been segmented into five major regions namely North America, Latin America, Europe, Asia Pacific (APAC), and Middle East & Africa (MEA). In terms of value, North America is expected to be the fastest growing market, registering a CAGR of 4.4% over the forecast period. Asia Pacific is also expected to be an attractive market in terms of opportunities for diabetic gastroparesis drugs manufacturers and investors during the forecast period. The MEA region is expected to account for 7.4% share in the global diabetic gastroparesis treatment market by 2016, registering a CAGR of 2.9% over the forecast period. Janssen Global Services, LLC, Salix Pharmaceuticals, Inc., Abbott Laboratories, Medtronic, C. R. Bard, Inc., Kimberly-Clark Corporation, Boston Scientific Corporation, Cardinal Health, Inc., Rhythm Pharmaceuticals, Inc., Evoke Pharma, and Alfa Wassermann SPA are some of the leading players operating in the global diabetic gastroparesis treatment market.